Dr. Dan Lewer, class of 2008 and veterinarian for the Oregon Coast Aquarium, has recently been treating two sick sea turtles. Both are females from different endangered populations and both were found stranded last November on different beaches in the Pacific Northwest. 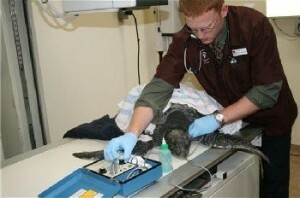 The turtles have been treated for dehydration and hypothermia. As soon as both are stable, they’ll be sent to SeaWorld Turtle Rehabilitation Center in San Diego, Cal., to finish their rehabilitation before being released back into the ocean. Follow this link to Salem-News for the full story.